The earlier you respond to any car issue, the better off you’ll be. So if your check engine light comes on, don’t stress. Instead, schedule an appointment at our Glen Allen-Short Pump or South Richmond-Midlothian car repair shops. Whether the issue is as minor as a loose gas cap, a bad sensor, or something more, you can trust Aarrow Transmission’s ASE-certified mechanics to keep a small engine issue from turning into an expensive one. When Your Check Engine Light Goes On. Many drivers are relieved to know that a lot of common engine problems have relatively easy and inexpensive fixes. 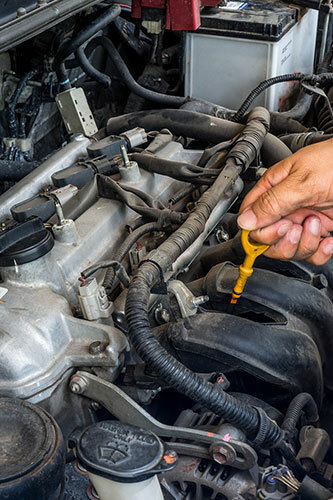 If your mileage has dropped off, for example, the remedy may be as simple as performing a tune-up or even just adding some fuel cleaner; if your car isn’t running smoothly, the fix might be as simple as replacing old spark plugs. On the other hand, a problem as simple as faulty spark plugs could lead to a larger one. If your spark plugs are causing your car’s engine to misfire, this could damage your catalytic converter, requiring a much more expensive repair. No matter the issue, our expert mechanics and state-of-the-art diagnostic equipment will identify it for you. And before we begin any work, we’ll make sure that you have a clear understanding of what we’re doing and why. The best way from keeping small engine problems from requiring big repairs is to follow your manufacturer’s suggested auto maintenance schedule. Bring your car into Aarrow Transmission for its scheduled maintenance, and our expert mechanics will closely monitor the systems and components of your car’s engine. If an engine part or system begins to show signs of wear or malfunction, we’ll repair it before it’s a problem – not after. A check engine light is a wake-up call, not a cause for stress or panic. If you see that light or see other signs of engine trouble, call Aarrow Transmission. We have convenient repair locations in West End-Glen Allen and South Richmond-Midlothian. We’ll give you the peace of mind you deserve, and get your car’s engine purring again. Oxygen Sensor - your oxygen sensor measures the quantity of unburned oxygen in your vehicles exhaust fumes. This causes the engine to be less fuel efficient by burning more fuel. It also has the potential to harm your spark plugs and exhaust. Exhaust System - This means your catalytic converter which converts carbon monoxide into carbon dioxide. Essentially this will cause your vehicle not to pass an emissions test. New vehicles are exempt for the first seven model years. Spark plugs - this is the spark that ignites the air and fuel mixture within the cylinders and keeps your car moving. You can usually tell if it's the spark plugs if you have trouble starting your car, high fuel consumption, lack of acceleration and more. Aarrow Transmission can help determine if this is your issue. Mass Airflow sensor - if the sensor is bad the engine will not know the right amount of fuel to add which causes issues with gas mileage and more. Check the gas cap - If your gas cap is loose or broken then fuel vapors can leak out which causes an issue with gas mileage and emissions.